First time freshmen admitted to the University of Nebraska at Kearney by March 1, 2019 will be automatically considered for the UNK Board of Regents, UNK Distinguished Scholar and the UNK Loper Achievement academic merit scholarships. There is no additional application required for these academic awards. The minimum academic benchmarks required to qualify for a scholarship award are a 23 composite score on the ACT (1140 on the SAT) and a cumulative grade point average of 3.20. Students are notified of scholarship awards if they qualify 10 to 14 days after admission. All self-reported information used to determine an academic scholarship will be confirmed once the official transcript is received from the high school. Awards are based upon sixth semester (end of the junior year) unweighted cumulative grade point average. The University will convert all grade point averages to a 4.0 scale. ACT scores through the February 2019 test date will be considered. The University will automatically re-evaluate a scholarship award due to an improved composite test score. The new test score must be sent directly to the University from ACT/SAT. Admitted students may also apply for scholarships that require separate applications. Read more about these scholarship opportunities. 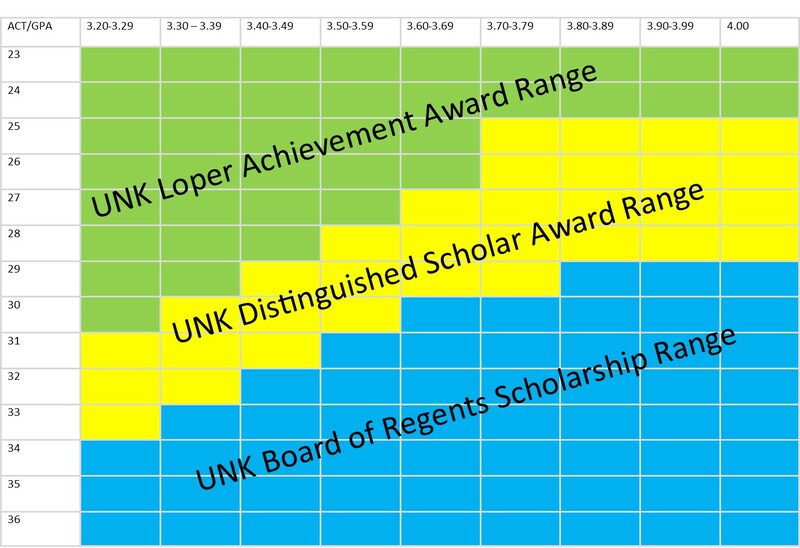 UNK Board of Regents Scholarship: Provides full tuition (not fees) for up to 125 credit hours. In order to renew the scholarship, recipients must maintain a cumulative grade point average of 3.25 or above and earn at least 24 credit hours during the academic year, fall and spring semesters combined. View the Board of Regents Scholarship Agreement which includes the renewal criteria. UNK Distinguished Scholar Award: Provides $3000 annually towards tuition for up to eight semesters. In order to renew the scholarship, recipients must maintain a 3.0 cumulative grade point average and earn at least 24 credit hours during the academic year, fall and spring semesters combined. View the Distinguished Scholar Scholarship Agreement which includes the renewal criteria. UNK Loper Achievement Award: Provides $2000 annually towards tuition for up to eight semesters. In order to renew the scholarship, recipients must maintain a 3.0 cumulative grade point average and earn at least 24 credit hours during the academic year, fall and spring semesters combined. View the Loper Achievement Scholarship Agreement which includes the renewal criteria.